Some people design a room around a prized piece of art or furniture. Margie designed a basement room around her foos ball table. Likewise, many people will design a meal around a key ingredient or bottle of wine. 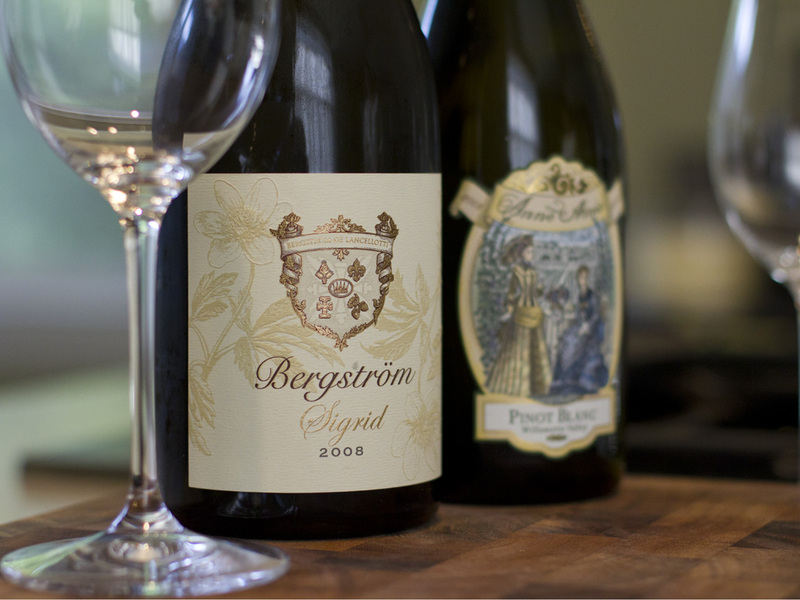 When Mike’s mom, Betty, was in town last week, her prized bottle of Bergstrom Sigrid Chardonnay was our inspiration. We like Chardonnay, but have never tasted a Chardonnay this heavenly. This wine is nimble and performs a waltz on your tongue. Feel free to snicker at this description (I sometimes mistake wine reviews for the Sunday comics), but only after you’ve sampled it. 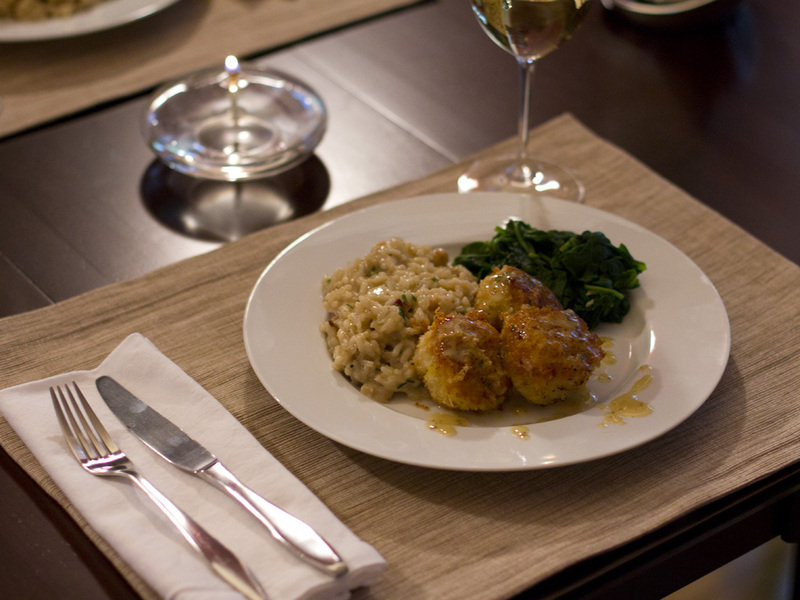 With Sigrid as our inspiration, we decided to make Parmesan crusted scallops with a clam and bacon risotto. Sauteed spinach was thrown in to provide veggie balance and aesthetics. This recipe has a short cook time so it was important for us to employ a ‘mise en place’ strategy. With three cooks in the kitchen, we divided, conquered and had all of our ingredients prepped before starting in on the risotto. Bacon was cooked and vegetables were chopped for the risotto. Lemon Thyme Beurre blanc was started. Scallops were prepped: they were washed, the legs were removed, and they were coated in the flour mixture. 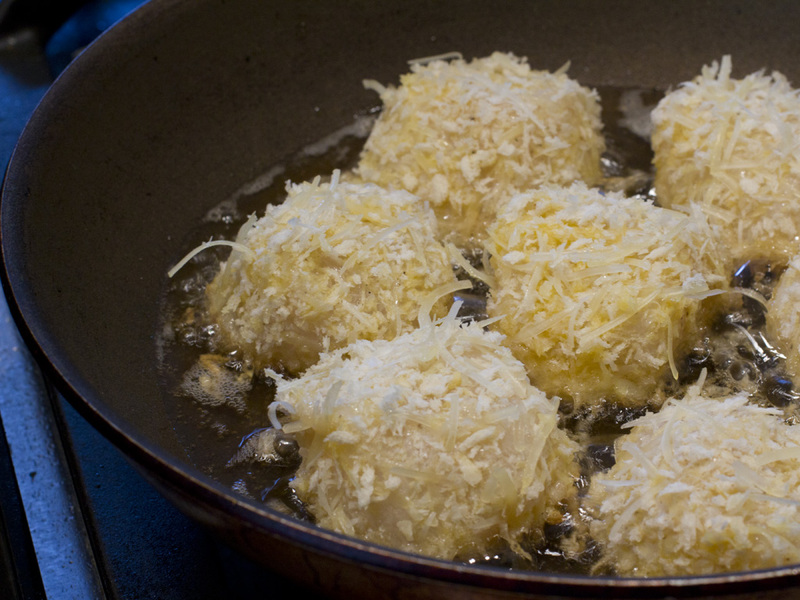 The parmesan mixture was assembled and egg was beaten (we held off on coating in the parmesan mixture until right before cooking the scallops). The butter used to fry the scallops was clarified. 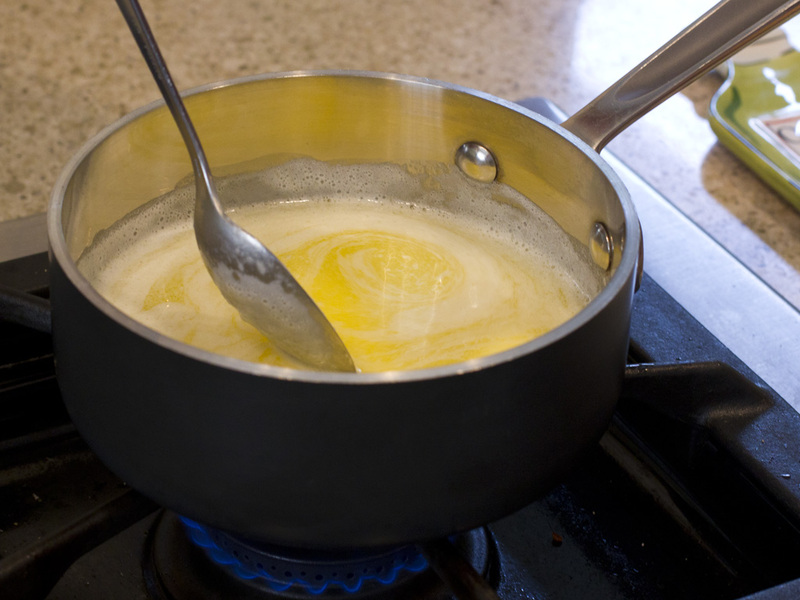 Terminology Time-out: Clarified butter allows you to cook using butter (with all the yummy flavor that only butter can provide) at high temperatures without burning the food. To clarify butter, melt unsalted butter until it bubbles and spoon the foamy fat off the top. Pour off the clear liquid into a container (leaving behind any thick, milky residue at the bottom). You can even freeze clarified butter if you seal it tightly. We had to open a bottle of dry, white wine to use in our risotto so we enjoyed an aperitif of Anne Amie vineyard’s Pinot Blanc after starting the risotto but before beginning to cook the scallops. Season each scallop with salt and pepper and toss with flour. 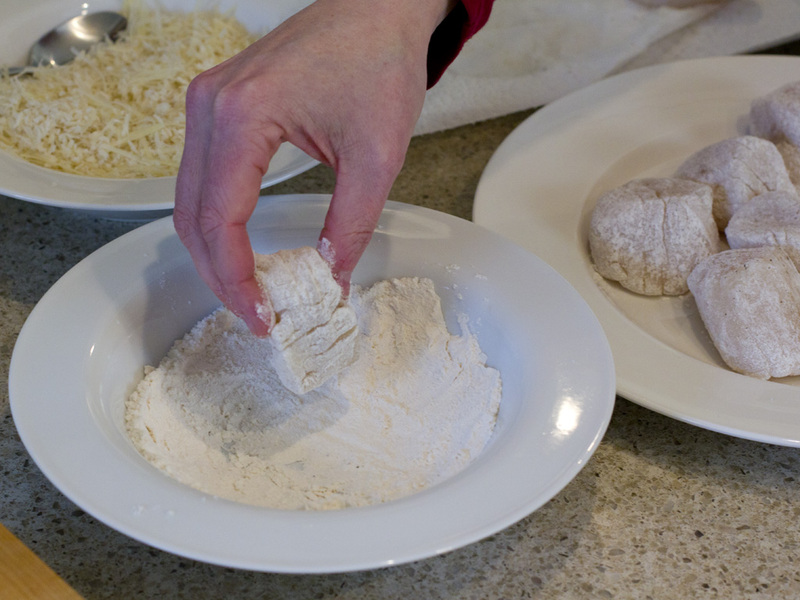 Mix bread crumbs with Parmesan cheese. 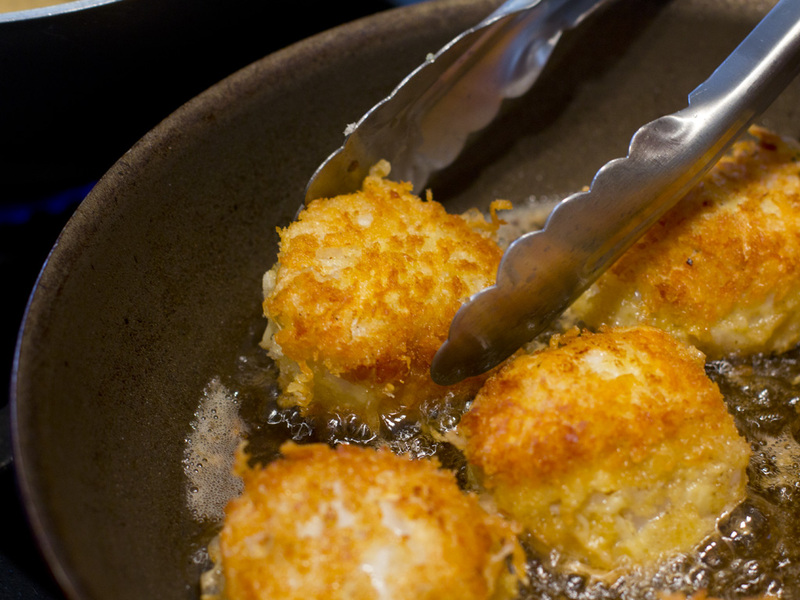 Dip each scallop in egg, then press into bread crumb mixture, coating on all sides. Preheat clarified butter in a large sauté pan. Fry each scallop on both sides until golden brown. Place scallops on a baking sheet and bake for 3-4 minutes, until done. Serve with Lemon Thyme Beurre Blanc. Pull 1 tsp. lemon thyme off the sprigs and chop finely. Reserve. Save the rest of the sprigs for steeping in the wine. Bring Marsala wine and onions to a boil in a small sauce pan. Cook until it has reduced in volume by half. Add water and return to a boil. Remove from heat. Add lemon thyme sprigs and steep for 20 minutes. Strain the wine mixture and return to sauce pan. Add cream and chopped lemon thyme. Bring to a boil and simmer for 1 to 2 minutes. Remove pan from heat. Whisk in butter cubes one at a time. Let the butter melt and be incorporated before adding the next cube. Season as needed with salt and pepper. As planned, we finished cooking the scallops last. 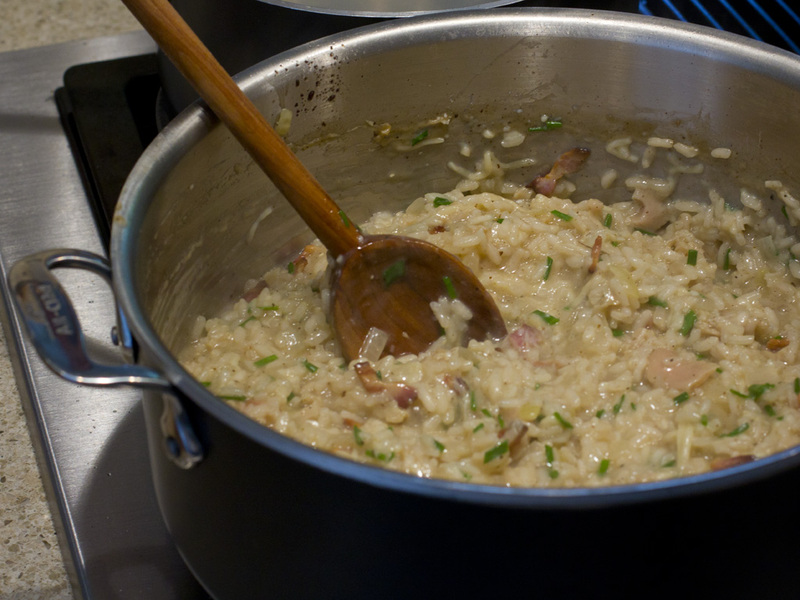 We assembled a generous portion of risotto before planting the mammoth scallops and token greenery around it. The scallops were outstanding and extremely decadent. And did I mention the Sigrid?? ?